Apple apps such as Pages, Numbers, Keynote and GarageBand are coming pre-installed on the larger capacity iOS devices. Currently, when you launch the app it asks for an Apple ID. To resolve this, use the Force App Management button to convert the app. You can convert pre-installed apps from devices without wiping them or deleting the apps through the use of the Force App Management function in Mobile Manager. This converts the apps from User Installed (default) into Managed Apps and will remove the need for an Apple ID when launching the apps. In order for the Force App Management function to work, you will need to install the apps you wish to convert into a group as Managed Distribution and you will need to obtain free licenses for the apps. The device/user will need to be in a group where they will inherit the app. 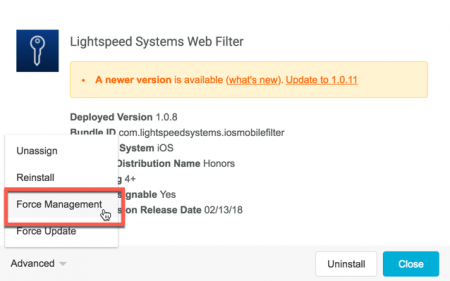 If you haven’t already done so, you can claim free Managed Distribution licenses for these apps from Apple. Once you have the above in place, there are several ways to Force App Management. 1. Navigate to the group where you installed the app in question and click on the app name. In the app window, click the Advanced button, then click Force Management. 2. At the Group level, navigate to Settings > Admin Tools. 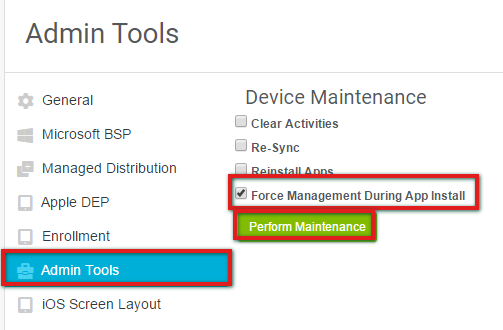 Check the Force Management During App Install option and click Perform Maintenance.